"I hosted Happy Birthday R.J. at Bellamy Manor & Gardens Bed and Breakfast in Enfield NC this past Saturday April 14th 2012. We had 14 people in attendance. All went smoothly and all had a great time. I was surprised that even though people had 2 pages of notes to read and understand (plus a 2 page introduction the night before) – everyone got into character and had fun with it. See here." "Ran Happy Birthday RJ last weekend. Excellent – everybody enjoyed it. I had to add the additional character (i.e. Ginger) and to add to the enjoyment, I provided him with a gold pen which was stolen by one of the characters at the party. The whole evening went down very well and after I've given my wife time to recuperate I will purchase another mystery from you." "Fun. Happy Birthday R.J. was an entertaining evening that is unique, something our friends look forward to every year. We enjoy these games and choose them based on the number of people that we have to play (for an annual party that we've played for the last 5 years). I like the flexibility that people have with their characters (to tell the truth or not), mingling during a buffet dinner and the twists that are in each game"
"We played Happy Birthday R.J. for our daughter's 16th birthday. She invited 14 of her closest friends and they had a blast. Many of the girls played male characters but that just made it interesting and they had fun hamming it up. None of the girls had been to a murder mystery party before so it took them a minute to get going but when they did anything went. It was a night that they all will remember and we hope to have another this summer just for the fun of it. Thank you so much." "Just a short note to let you know we held our Murder Mystery [Happy Birthday RJ -- below] last night and everyone had a ball. This morning I have had all my guests ring me without exception, to tell me what fabulous party it was last night and that they had never had so much fun at a party. So, thanks guys for the game. I have already had people ask me where I got it from, so I have given out your web site. Thanks again. " "Over the years I've had many murder mystery parties, and once I found Freeform Games I never went back. I played Happy Birthday R.J. last year for my 17th birthday party and I think it was one of my favorites. Freeform makes it so easy to have fun. My friends and I are actors, so we love to dress up and improv, but anyone can do it. (I had my uncle, and my 9 year old cousin in it too) It's so fun, and my friends and I look forward to it every year. I'm planning on having another one next month for my 18th birthday!" "I played Happy Birthday R.J. for my own 25th Birthday last weekend, and all of my friends are still going on about it! Everyone got involved in the Texan accents, and we can't wait to try out the next Freeform game!! Thanks so much for a flawless evening :-)"
"Last night I played your murder mystery Happy Birthday R.J. with some friends from university. I just want to thank you for having created such a wonderfully fun and engrossing game. Each of my guests said they had had a fantastic time and I had just as much fun as the host. I've played several 'scripted' Murder Mysteries in the past, but I have to say that yours was vastly superior and I'll certainly return to Freeform Games in the future." "I hosted Happy Birthday R.J. in 2005. The murderer being determined by me (the host), was awesome. I had several potential characters that I could have pulled aside and told they were the murderer, but I ended up picking the one who seemed to be playing out her motive the strongest, and it worked out beautifully! This was the first Dinner and a Murder I ever did, and to date was the best one – mainly because of that aspect! I have since done 3 more – and am planning my next one for next Spring." "...the game and evening was very enjoyable and it worked very well indeed." 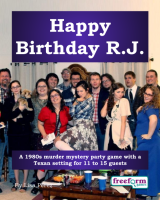 Happy Birthday R.J. is a dinner party murder mystery game for 11 to 15 guests and a host – download the free introductory pdf file. Happy Birthday R.J. lasts for about four hours and is suited to an evening. It is often played over a meal – a finger buffet if possible to allow guests to circulate and talk in private. "We played Happy Birthday RJ for a 13 year old's birthday party (with slight adaptations!). A group of teens who had never done an rpg before had what they described as the best party they'd been to and they are looking forward to the next time. Keep up the good work." The free introductory pdf file contains an introduction to the game, a cast list of all the characters, and a copy of the Perm Creek Newsletter – plus details of how to buy the game. Billy Joe Butler – Jack's best friend and neighbour. Bobby Harrington – R.J.'s half brother, a sweet and caring southern boy. Recently returned from university and started in Harrington Oil. Crystal Harrington – Jack's wife and R.J.'s step-mom, glamorous and gorgeous with the best shoulder pads in town. Deedee Taylor – Sweet Deedee is Dixie's best friend. Dixie Green – R.J.'s lovely girlfriend, a pretty little southern belle. Dolly Douglas – A school friend of Lucille's. Drew Morrison – Drew used to be a doctor in Houston and has recently moved to town. Jack Harrington – R.J.'s dad, suave and sophisticated oil tycoon and old cattle ranching money. Lucille Harrington – R.J.'s half sister, beautiful, buxom but petite little Lucille, butter wouldn't melt! R.J. Harrington – The birthday boy himself, a slick southern boy with a cheeky look in his eye. Randy Coltrane – A friend of Bobby's and the Perm Creek Deputy Sheriff. Rick Harper – An old friend from school and one of R.J.'s most handsome friends. Sam Bond – A good family friend. Sue Helen Butler – Billy Joe's wife, an expert horsewoman. "Happy Birthday R.J. was a thoroughly good night's entertainment for all. Young and old!" Happy Birthday R.J. costs £20.00 (GB pounds) or US $29.99. You can buy it in either currency, from anywhere in the world, as you prefer. The price will be converted back into your own currency for you, at today's exchange rate. We offer a Cast Iron Guarantee on all our murder mystery games. If you're not completely satisfied with Happy Birthday R.J. then please let us know within 30 days and we will refund you. See our full terms and conditions here.